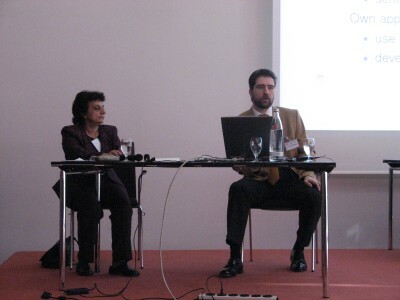 The conference was opened by Lutz Maicher, who is the main person behind it. He then left the podium to give the platinum sponsors five minutes each to present themselves. The first was USU, a German software company selling Topic Maps software (they say; I know nothing of their products), apparently with an emphasis on automating the process of building the topic map. The other two sponsors were Ontopia and Topic Maps 2007 (the Norwegian Emnekart conference has now gone international). Then Robert Cerny got up to introduce Topincs, his new Topic Maps authoring tool. The conference has set up a Topincs instance with a basic topic map of the conference in it. Every attendee then gets an account in the system, and people are encouraged to use Topincs to describe and discuss the conference. This year we have managed to get Steve Newcomb, the inventor of Topic Maps, as the keynote speaker. 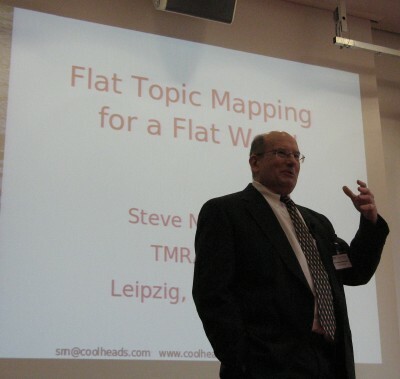 His title is "Flat Topic Mapping for a Flat World", and he started out by investigating what it is that makes the Topic Maps community a community, and what makes it different from other communities. He considered many possible answers only to discard them, and eventually concluded that "that we believe that only having one topic per subject is important" (or, if you like, merging) is the answer. After this follows an inimitable Steve Newcomb riff on the use of symbols to express meaning, and the connection between this and the general human condition of existence. In fact, I would describe the keynote as a piece of ontology reminiscent of Heidegger. A highlight for me was when Steve enlisted Patrick Durusau, sitting at the back, to tell the story of Bertrand Russell and the turtles. After the keynote the conference divided into two tracks; I chose the one titled "Creation and Visualization of Topic Maps". The first speaker was Markus Ueberall with "On Topic Map Templates and Traceability". His subject is the use of Topic Maps to support collaborative software development, by using Topic Maps to track the information flow in the project. He uses an ontology drawn from various sources, such as UML 2.0 Superstructure, and so on. The templates come in because this is how he represents the constraints on his ontology, so he's made a set of conventions for representing the constraints in the topic map using associations and topics. He uses a mechanism he calls "nested templates", but I wasn't able to catch how that worked. He then went through how he could model the software development process with Topic Maps, but it gets too involved for me to try to describe here. His goal is to create an Eclipse plug-in. To this end he's built a lightweight Topic Maps engine using aspect-oriented programming techniques, and he's currently investigating rule languages and query languages. The next speaker was David de Weerdt, of Space Applications Services, presenting TopiMaker, a Topic Maps editor and viewer. It's part of a bigger system called TopiWriter, that will be presented in another talk. According to David it's currently in alpha, and it's a desktop tool, not a web-based system. One aspect of the system is a graphical visualization that shows the topic map on a 2D plane in a 3D world. Think of it as a graph (circles and lines) drawn on a piece of cardboard that's then tilted at an angle. They avoided 3D because they wanted to avoid objects in the foreground obscuring objects further back. In 2D they wanted to avoid overlaps, and get an attractive symmetrical layout. They use the fore-directed placement method also used by TouchGraph, but have modified it by placing the nodes on a grid so that they do not need the repulsive forces (to avoid overlap). They also made other improvements. To make use of the 3D aspect you can move the camera (or viewpoint, if you like) around, or you can use automatic camera guidance. They use three planes above each other, but I couldn't quite follow how this was used. They also support dragging of nodes (like in TouchGraph). The first presentation I listened to after lunch was Michael Chapman's "Experience in Building the Semantic Web", which is about his work to move the WWW Virtual Library to Topic Maps. The WWW Virtual Library developed from Tim Berners-Lee's original index of all the web servers known (in 1992) into a Yahoo-like portal with a subject-based classification and search. One interesting thing they do is to make a log of the most common searches; they have found this useful as a guide to what users are looking for. The actual site is based on a static LTM file, which is then converted into a web site using simple Perl scripts (which they wrote themselves). The conversion runs every night. They have a hierarchical catalogue of ~200 member libraries, and have translated this into many languages. The effect of the Topic Maps-based catalogue was neutral with respect to traffic, but the member libraries report significant traffic increases. (I think it's tempting to interpret this to mean that the traffic was much more relevant because people get a better idea of what they are looking at.) Another result was that visitors viewed more pages per visit, and revisited more often within the same month. One of the main things they are planning to do next is to start using PSIs. I was the next speaker after Michael, on TMSync, which is a method for synchronizing part of one topic map based on part of another. The idea is to make it is easy to update your own topic map with changes that happen in another topic map. Steve Newcomb chaired a session of short presentations about the posters, where the first presenter was Patricia Liebetrau, presenting a project she is working on to collect materials from the South African struggle against apartheid. The materials are everything from underground journals, minutes of political meetings, ANC materials, etc etc. The challenge here is to organize all of this so that people can actually find their way around this, and this is where Topic Maps come in. Her goal with coming to the conference is to learn more about Topic Maps to find out where to take the project next. Johannes Schmidt and Andreas Stephan presented PHPTMAPI, which is a translation of the TMAPI API for Topic Maps from Java to PHP, with an implementation of the core interface known as QuaaxTM. I was still typing up the previous presentation (and chatting with Tommy), so I didn't get any further details. Thomas Flemming presented his work on querying Topic Maps in natural language, using Prolog. The idea here is that the topic map contains enough information that given the string "Which operas were composed by Puccini?" the system should be able to translate this to tolog (or TMQL, or whatever) directly and produce a result. Martin Krüger and Jan Hellich presented a TMAPI implementation that is based on web services, so that you can use TMAPI to access remote Topic Maps servers without having to be aware that the server is remote. The basic idea is to do lazy loading of data from the server, and to create proxy objects on the client for their counterparts on the server. They have not done performance testing, they say, because of a lack of resources. Motomu Naito (generally known to the world as Naito-san) presented his idea for a simple example topic map based on a genealogy ontology that he has created. The idea is that this provides a simple, understandable test bed for all kinds of technologies. 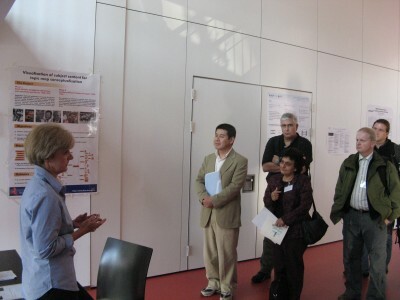 On his poster he shows as examples visualizations of topic maps containing Johann Sebastian Bach's family tree, as well as the Japanese Emperor's ancestry. This lead to heated discussion of the ontology. The open space session is where anyone can sign up to speak on any subject at all, and last year this was one of the best parts of the conference. This year, the first person out was Naito-san, on how he had created topic map with botanical information. He built the topic map partly from relational data (in CSV form) and partly a hand-written LTM file. He used the DB2TM converter in the OKS to convert the CSV data into a topic map, then merged it with the LTM, and finally exported it all to TM/XML. A friend of his then used XSLT to create PDF from the topic map. Graham Moore then got up to exhort the community to create a standard web service interface to Topic Maps servers. There was general agreement that since we now have at least 5 different web service interfaces to Topic Maps offered by different systems it may be time something was done about this. 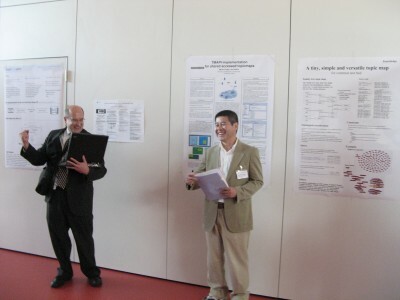 The next speaker was Professor Jaeho Lee, who presented his proposal for GTM (the Graphical notation for Topic Maps). He has created an Eclipse plug-in that implements one of this proposed notations. He also has a another proposal that is more free-form. The final speaker was Xuan Baldauf, who presented Atmo, a Topic Maps editor written in Java. The interesting thing about Atmo is that it uses a probabilistic model computed from the form of the topic map to predict what the user is going to choose next when creating associations. Xuan called this a "soft schema" instead of the normal "hard" ones. Xuan is a Linux user, and had problems with the projector. He eventually borrowed professor Lee's laptop and used Java Web Start to get Atmo up and running. There was a moment of hilarity when a firewall dialog in Korean popped up.